After the exterior details, the next part of this ‘Ultimate Gucci Guide’ series is the bag hardware. This will help you in buying Gucci purses on Ebay. In order to spot a real Gucci bag, you need to add this hardware knowledge to your arsenal. This post will discuss this, along with clear photos. An authentic Gucci bag will have its hardware either plain or marked with ‘GUCCI’. There is no one-size, fits-all formula here. However, in the event that a bag you are eyeing has GUCCI engraved on it, it could help you in identifying its authenticity. A common thread in this authentication tips series is the premium given on the GUCCI font logo. It is found on the leather tag, as well as the exterior markings. The crisp and clean lines of the GUCCI font (together with the registered trademark symbol ® and ‘made in italy’) is a cornerstone of the details you need to know. In the next post discussing Gucci zippers (pulls and marking underneath), you will also see that the same screw head appears in authentic zipper pulls. Do you know if Gucci ever used pentagon like buttons on each side of their bags that have the Rights mark then GUCCI below it then made in Italy below it? I am so unsure if a tote bag I placed a bid on (via eBay) and won, but have not paid for is counterfeit. I have searched endlessly and have not found a similar bag with the pentagon buttons. It was listed as new with tags and has a Neiman Marcus tag on it; however, something just seems off about it. The seller has now listed a wallet too and it does not seem authentic either. This will be a gift for my daughter and her first “higher” end bag so I definitely don’t want it to be a knockoff, especially a $375+ knockoff. Did you manage to get the bag? Post the link to the Ebay auction for the Gucci bag so I can have a look. Cheers! I purchased this vintage tote. However, I’m now not sure if it is authentic or not. There is no tag on the inside, but the quality seems sound. If you can help me take a look at it and give me your opinion, I’d really appreciate it. Thanks so much! Hi! Still need to see any Gucci markings inside. Cheers! Can you help with authentication of a “Gucci” bag? I have used two different sources, one that charged a small fee, but neither has been able to state that this bag is authentic or a fake. I would like to know one way or another. So could you please advise me as what to do. Please any advise would be greatly appreciated. Yes, please paste a link to the photos here. It will be of a great help to others if photos are made public. Cheers! Do you know if vintage gucci bags ever used ‘talon’ zippers? Yes, I have seen an authentic vintage Gucci bag with a TALON zipper. I bought a Gucci Boston bag black on eBay. This bag doesn’t smell like leather. But the stitching and finishing look real good. This has serial code 387605 on the top row, 14093 on the 2nd row. So what do I need to look at to be able to know if this is fake or genuine pls? Hi! Please post photos of the bag (link) so we can have a look. Cheers! Are you able to advise on a Gucci Nice microgussima patent bag? I just purchased on Ebay and am not familiar with the product line. Is there supposed to be a black fabric tag inside the zippered pocket of this bag? Also are the 2 open pockets completely sewn shut on the bottom hem? On mine the bottom corners are open. In other words the seam does not go all the way across the bottom of the open pocket. I ask because there are a few of this style for sale and they are seem to vary when it comes to these 2 things. Hi! Please post a link of the detailed photos of your bag, especially the Gucci tag and serial number. The Ebay auction is not showing any of those. You may upload it on Photobucket or Tinypic. Cheers! Has Gucci ever made a hobo bagwith Made in Italy (note caps) on the serial tag and hardware? 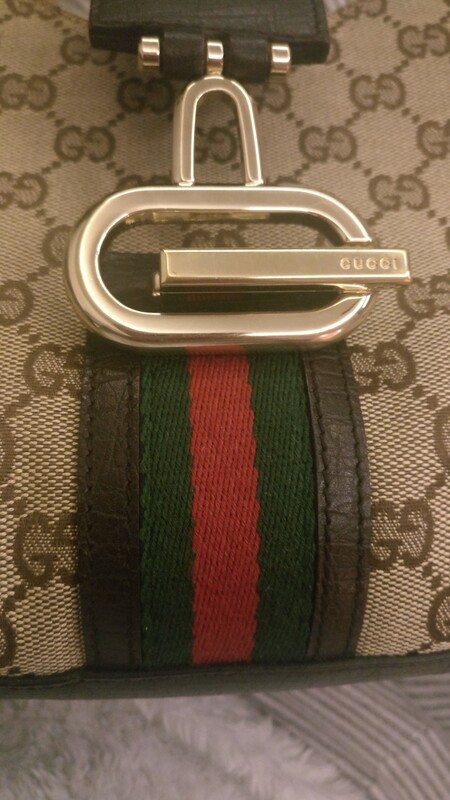 Hi, i bought a gucci bag on mercari. Seller said she bought it in europe and i believe her. The tag and markings look authentic to me but when i have it authenticated twice, they said its fake. Need help! Hi! Would you have photos of the Gucci bag in question? I can have a look. Cheers! Hi I have a Gucci bag that was my grandmas and I am not sure if it’s real or not. Would be able to tell with a photo? Hi Susie! For this free Gucci bag authentication, I will be needing clear photos of the Gucci bag, especially the Gucci tag and serial number. Please upload on Imgur or Tinypic, and put the links in your comment. Cheers! Hi Randi! This is obviously a keyholder made out of pigskin from the 80s. Not the 70s. Thank you for taking a look. Happy Holidays! You’re welcome, Randi! Happy Holidays, too! Hi there, I was wondering if you could tell me if my Gucci Hobo Guccissima BLack Leather bag is AUTHENTIC? I purchased the bag a couple of weeks ago from a seller on Ebay. Any help would be greatly appreciated . Hi Deblyn! For this free Gucci bag authentication, I will be needing clear photos of the Gucci bag, especially the Gucci marking inside the bag. Please upload on Imgur or Tinypic, and put the links in your comment. Cheers! Hi Denise! You’re welcome, and again, this is authentic. Cheers! Dear bagaholic but the serial number is 130995 467891 not 180995 467891. Or I couldn’t tell it clearly from the photo. I bought the bag, I hope it is not fake. One last question, is it possible to take the bag to a local gucci store and ask them to authenticate the bag saying that it was a gift from a dear friend? Do they do such stuff or do you basically kick you out of the store? thanks so much for the reply. Hi Denise! Yes, I misread the number 3 to 8, but it is still an authentic bag. As for taking a bag to a Gucci store, they will not authenticate it nor the SAs (sales assistants) are allowed to do so. They will just flat out refuse any legit check in Gucci store, but the closest you can do to this is ask for a quotation on repair. They will not repair a fake bag (although they might also refuse if it is a very old model). Good luck! dear bagaholic thank you. there is just this one thing that hs been bothering me with the stripe on the handbag. do you think it is normal that the stripes are not symmetrical? here are the photos of what I mean, is it human error or does this mean the bag is not authentic? Hi Denise! The links you gave are not working.